Welcome to Catch it at the Comic Shop, where the Panel Patter team looks at what's coming out at your favorite store or digital device this week. Each one of us that participates this picks three single issues and one trade for your consideration, with a little bit about why we like it. Mage: The Hero Denied by Matt Wagner, Published by Image Comics. 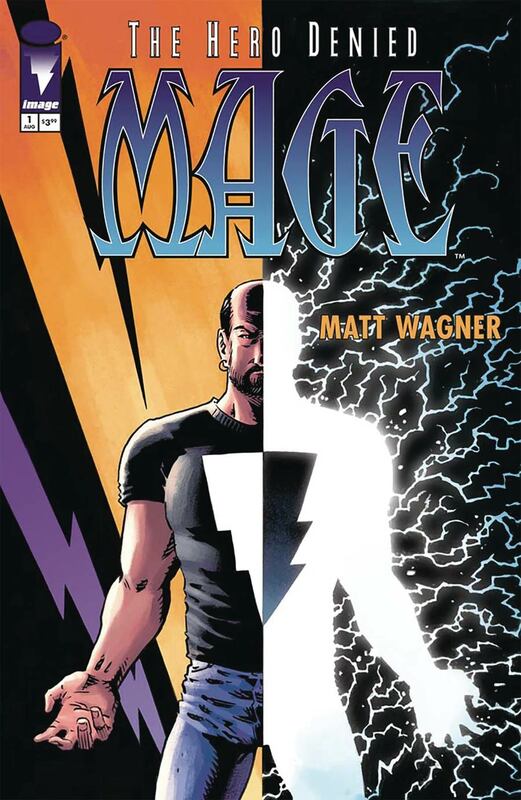 Wagner is one of those creators that I'm an unapologetic fanboy about (and, yes, I'm one of those still waiting for him to return to The Aerialist) and the real first issue of this series starts asking all of those old questions again. I plan to have a full review of this up later this week but if you've been waiting for this third volume of Wagner's semi-autobiographical series to begin, this issue demonstrates just how personal this story is for Wagner as Matchstick has to protect his family. So that makes the colors by Wagner's son Brennan Wagner that much more special. Southern Bastards #17 by Jason Aaron and Jason Latour, Published by Image Comics. 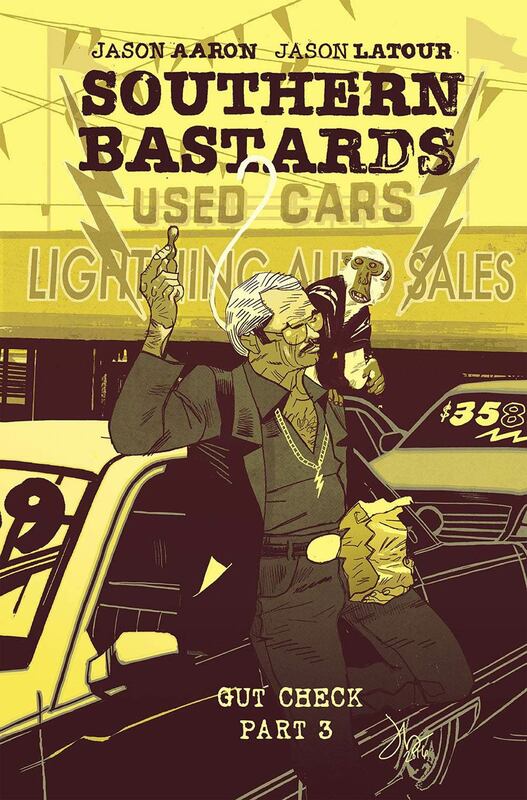 In some future history of Image Comics, Aaron and Latour's Southern Bastards may just be considered one of the companies' greatest books of this decade. Especially in this 2017 political environment. I want to say that they continue to make Coach Boss a sympathetic villain but let's just face it, he's simply a villain. After this past weekend, it's harder to read this book other than as some kind of indictment not just of the south but of our country that lets these crimes and hatred continue without calling them out for what they are. Dark Nights Metal #1 by Scott Snyder and Greg Capullo, Published by DC Comics. I know that there are all kinds of spoilers out there right now about this comic but I'm trying to avoid them all. I was about to click on a link last night that promised a last-page shocker but I stopped myself and showed some restraint which is something I hardly ever do when spoilers are involved. Don't click on any of them. Wait until Wednesday to find out what's going on with this comic. If it's half as nuts as those prologue books were, this is going to be some kind of trip. 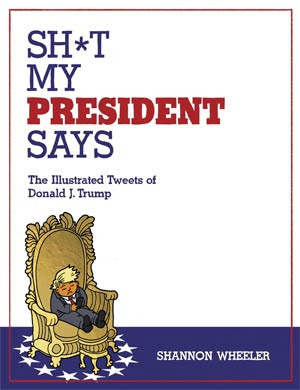 Sh*t My President Says by Shannon Wheeler, Published by IDW. I don't know what more to say about this book other than point out this attack on a black CEO that resigned from one of Trump's worthless commissions. That gets to be one of the tweets that Wheeler gets to include in the inevitable second volume of this book. Remember, we're just over 200 days into a 1,460 Presidential term. There's only more of this to come. Sexcastle by Kyle Starks, Published by Image Comics. Sexcastle is the baddest dude ever. Do not mess with that guy. Seriously, he knows a lot of ways to kill you. Are you a fan of 80's action movies (any answer other than yes is unacceptable)? If so you should absolutely pick up Sexcastle from Kyle Starks. It's an outrageous, hilarious, ultra-violent homage to over-the-top 80's action from Arnold, Sly, and a zillion other movies (Image Comics is releasing a new edition of the book). Stark's deceptively simple style works perfectly here, as he's a master of quick sequential storytelling. He's also really hilarious. I highly recommend this one. Divinity #0 by Matt Kindt and Renato Guedes, Published by Valiant Comics. Valiant has put out some terrific comics since it started up again in 2012, and if you've been interested in learning more about the Valiant universe, Divinity #0 seems like a terrific way to get started. 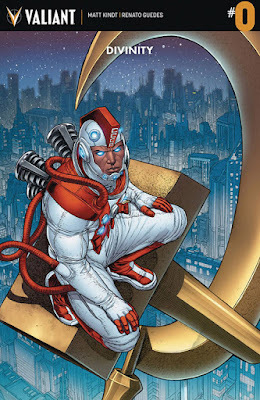 Divinity is a super-powered being in the Valiant universe, and his stories (also written by Matt Kindt) are some of my favorite comics from Valiant. He's a weird, interesting character - a Cosmonaut who went into deep space and came back fundamentally changed. He's sort of like Doctor Manhattan, but with more clothes and nicer. Anyway, this issue promises a tour of the current Valiant universe through Divinity's eyes, and should be worth a look. 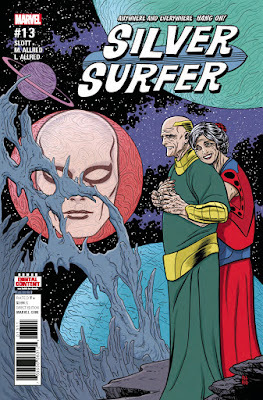 Silver Surfer #13 by Dan Slott, Mike Allred and Laura Allred, Published by Marvel Comics. The Slott/Allred run on Silver Surfer is coming to a close soon, and I'm really going to miss it. It may eventually end up being on of my all-time favorite comics. I just love everything about it. The Allreds' art is more gorgeous than I've ever seen it, and that's saying a lot. And they and writer Dan Slott are telling a funny, thoughtful, sweet, romantic story about love and loss and exploration. It's worth your time to go back and read this one from the beginning, it's worth it. Southern Bastards is a story full of complex, terrible people. There are no cheap and easy villains in this story. Their complexity may explain why they're terrible but it in no way excuses it. This is an absolutely compelling story that really gets into the dirt and grime of people living in a small town in Alabama where football and organized crime are king. Latour's stylized, beautifully ugly art perfectly tells the story, and this really does feel like it's created and illustrated by people who know what they're talking about when it comes to Southern culture. 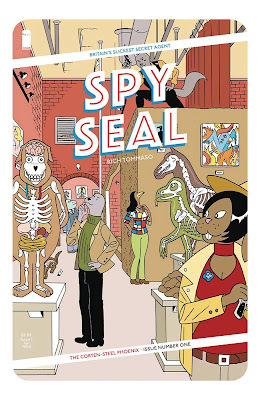 Spy Seal #1 by Rich Tommaso. Published by Image Comics. Quietly one of my favorite creators, Rich's work usually features human characters looking sharp as he shows off his spectacular page layout chops and love of good old pulp crime. 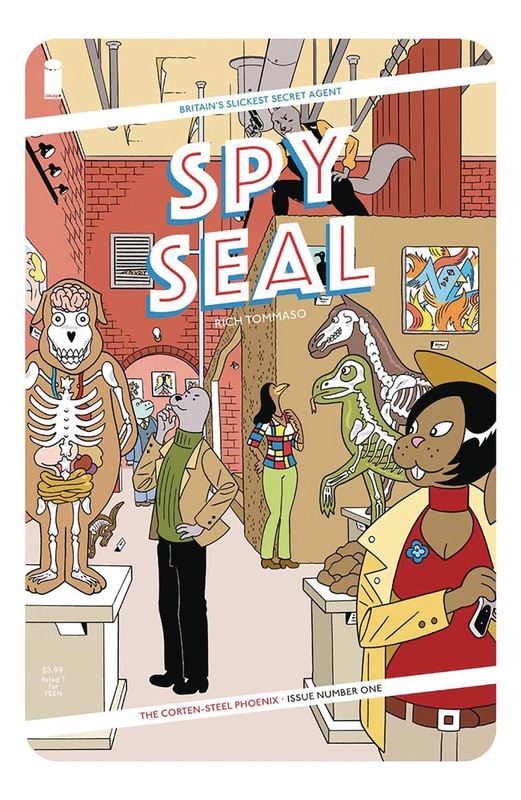 This time, he's moved into the animal kingdom, with Spy Seal, a book that returns to his thriller themes but adds a new dimension, playing with matching animals to their characteristics in a noir world where every step is treacherous. Yes, others have done this quite a bit, but they aren't Rich. If you like his work or the idea of using animals to demonstrate human vices, give this one a look. Haunted Horror #29 by Various Creators. Reprinted by IDW. 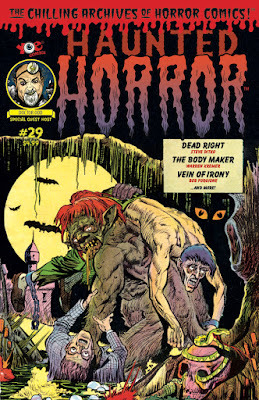 Anyone who reads Panel Patter knows my love for horror, and while sometimes these comics are horrific for entirely unintentional reasons, I love it whenever there's a new issue of this series, which digs deep into the many comics that featured anthology horror. They'll never be as good as the EC books, but they sure are interesting, especially when you look and see a creator name you know, like Mike Esposito, pop up out of nowhere, spilling bloody corpses at you. It's very much niche, but if you love old-school, free-wheeling comics, understand you'll hit at least one racist clunker, and want some obscure horror, this book's for you. 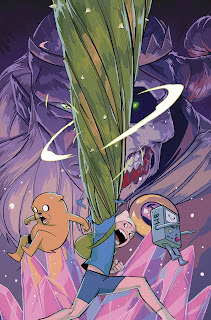 Adventure Time Comics #14 by Various Creators. Published by Boom! Studios. I love that after the success of the variant covers (ugh, but yeah, they were awesome) and backup stories, Boom! and Nick got together and put out this comic, which lets creators run amok in the Adventure Time world. This time around, Fred Van Lente heads the show, along with Steve Seeley and several others I'm not familiar with by name. Each issue features shorts by iconic folks having entirely too much fun, and if you enjoy the show, indie comics, and/or the main Adventure Time title, give this one a try this week. 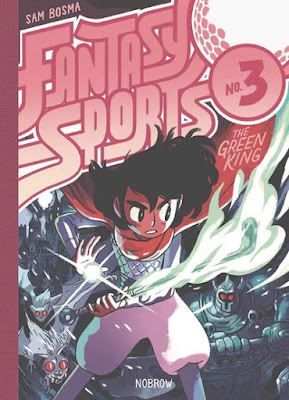 Fantasy Sports 3 by Sam Bosma. Published by Nobrow. My trade pick is a layup, if you'll pardon the pun (or even if you don't), as Sam Bosma returns with a third volume of his unbelievably fun series that mixes magic with physical exertion. Bosma's style incorporates some of the best artistic tricks from manga while not feeling like he's trying to copy shojo whole cloth. It's very free-flowing and almost explodes across the page. I love this series so very much, in which an enthusiastic young character partners with a bombastic older character, periodically clashing with each other while trying to stop the bad guys. Amazingly, the bad guys all want to play sports, from basketball to volley ball to...oh my god, this time it's MINI GOLF. 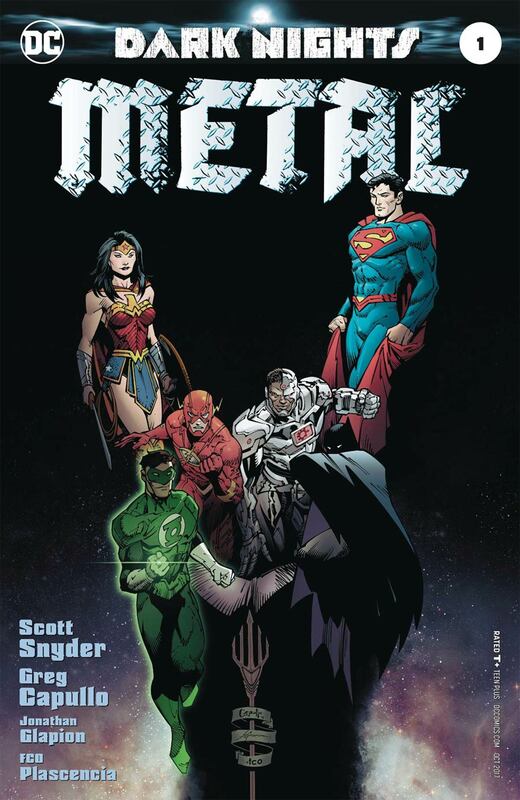 Hold on, if you need me I'll be at the comic store camping out to pick this up tomorrow.